Manuel Palos offers classes in stone carving designed for individual instruction as Manuel guides your vision. Classes are once a week for four weeks and other studio times can be arranged as needed. 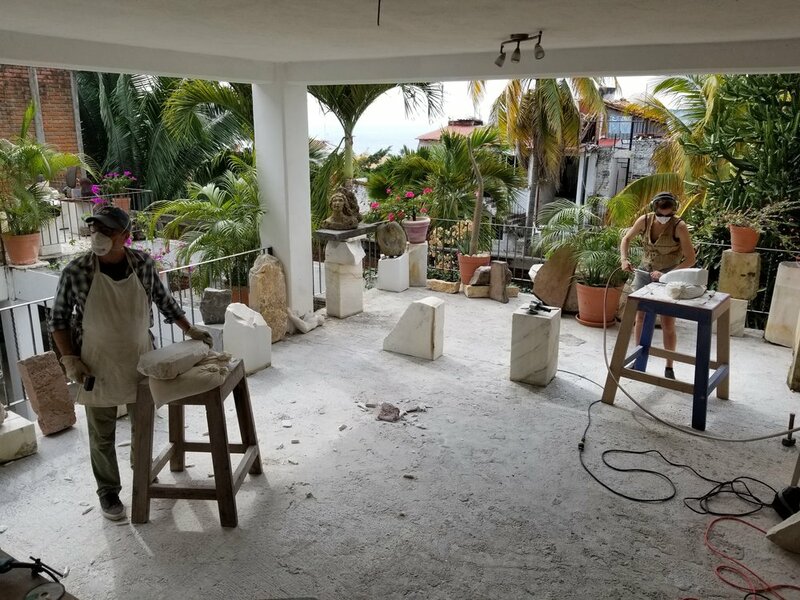 Students create a basic idea in sculpture to full scale or directly carve their ideas in marble, limestone or alabaster in the process learning different tools of the trade. The class emphasizes safe studio practices, hands- on demonstrations, carving techniques and pneumatic techniques. To sign up for a class or request a brochure, please contact us for further information. You can also download a copy of our brochure by clicking here. Manuel Palos out of his love and commitment to the time honored techniques of stone carving and sculpture has built a studio and guest house in Puerto Vallarta, Mexico and holds workshops for others to learn first-hand the philosophy and practice behind these ancient art forms. For more information go to: www.palosstudio.net or contact us.